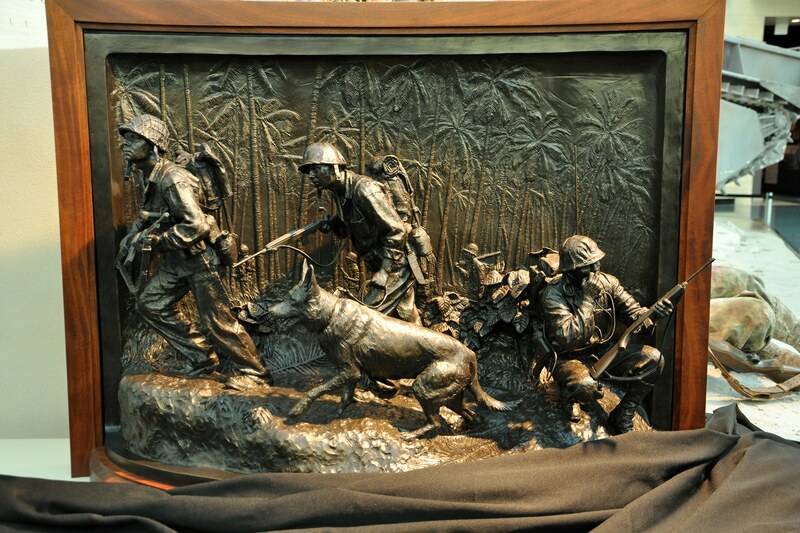 The National Museum of the Marine Corps in Quantico, Virginia, recently dedicated a sculpture in honor of the Marine Raiders of World War II, titled “Soul of the Forward and Faithful.” The artwork depicts a Raider, a War Dog Handler, and a Navajo Code Talker. 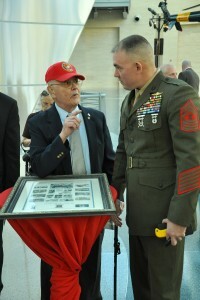 Freedom Alliance was invited to attend this dedication by Lieutenant Colonel Joe Shusko, the Assistant Director of the Marine Corps Martial Arts Program. The Martial Arts Center of Excellence at Quantico has become an informal museum of the Marine Raiders, holding artifacts from WWII, which have been entrusted to Colonel Shusko for posterity. At this modest ceremony, the artist, Mardie Rees, spoke of the Raiders history. Only active for two years, the unit’s feats of heroism have earned the Raiders a special legacy in Marine Corps history. Her piece, Rees pointed out, highlights the effects the men carried in the Pacific theater of war. This is the “gear that burdened them down, but would save their lives,” she said. There were three surviving Raiders in attendance, as well. Charles H. Meacham, a Raider himself and executive in the Marine Raider Foundation, said a few words about the unit. He explained how the Raiders popularized the slogan “Gung-ho!” which is a Chinese phrase meaning to work in harmony. 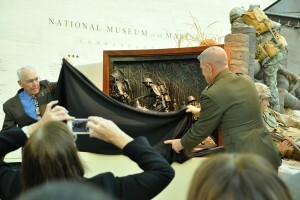 Meacham unveiled the sculpture with Major General Joseph Osterman. General Osterman is the commanding officer of Marine Special Operations Command (MARSOC). As of this year, the MARSOC service members are officially called Raiders, to commemorate their WWII predecessors. Their commander assured the former Raiders in the audience that their fighting heritage is carried proudly by the MARSOC Marine Raiders today. It was an distinct privilege to be present at the Marine Raiders sculpture entrustment ceremony. By fulfilling our mission to salute our current military veterans, Freedom Alliance is celebrating the heroes who have gone before. 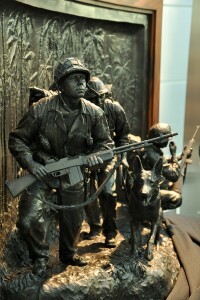 The sculpture is on permanent display at the National Museum of the Marine Corps.